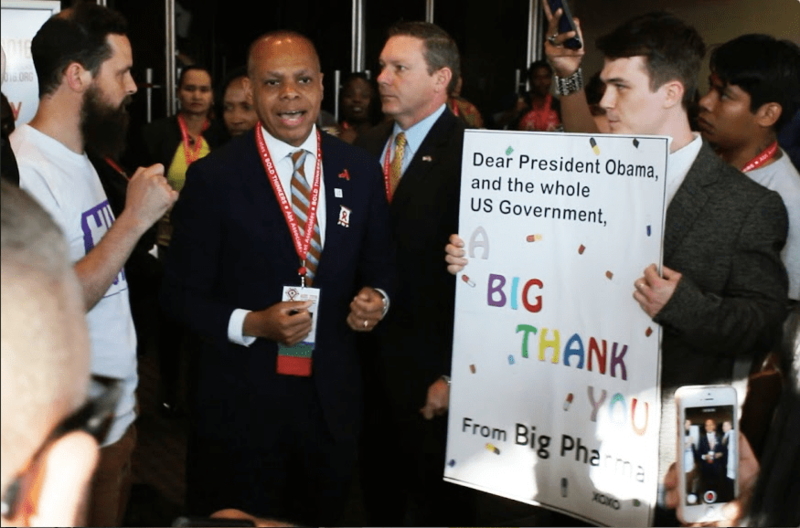 AIDS Conference: Will The UN High-Level Panel Report Deliver R&D And Access To Medicines? DURBAN, South Africa – The lessons derived from the history of AIDS treatment have become a rallying call for civil society organisations globally. Not being able to afford AIDS medicines should not be repeated for people with other diseases, including HIV co-infections, treatment activists told world leaders here. To press the message home, the civil society marched in their hundreds on the eve of the 21st International AIDS Conference on the streets of Durban and backed the act the following day, 18 July by handing a memorandum of demands to United Nations Secretary-General Ban Ki-moon. Since the 2000 International AIDS Conference in Durban treatments activists say they had huge success in ensuring more people have access to affordable AIDS medicines. Ban Ki-moon said that when the AIDS conference was last held in Durban, less than 1 per cent of all people living with HIV in poorer countries had access to treatment. Millions died waiting for medicines. Today, more than 17 million people receive treatment. He paid tribute to people living with HIV who are a constant reminder that health is a fundamental right, biomedical companies for producing medicines that are more effective and less toxic, generic medicines which transformed the AIDS response by cutting costs to just a dollar a day and international finance. Countries came forward with funding, such as PEPFAR, the United States President’s Emergency Plan for AIDS Relief. Many donor countries have supported the Global Fund to Fight AIDS, Tuberculosis and Malaria. Close to 18,000 participants are attending the congress marking the progress made in tackling HIV since the meeting was held at the same venue 16 years ago. Discussions also centred on challenges that still need to be overcome when tackling HIV and co-infections such as tuberculosis and hepatitis, limited research and development and growing drug resistance. But 16 years after that conference, AIDS can now offer a model on accessing affordable drugs. Cancer, hepatitis C, and drug-resistant tuberculosis patients are among those cannot afford life-saving medicines. Health rights advocates blame the intellectual property monopolies held by multinational pharmaceutical companies. “Instead of learning from the struggle for AIDS medicines, where generic competition lowered the price of antiretrovirals by over 99 percent, we are allowing the same morally abhorrent history to be repeated,” they said in their memorandum. “People with certain forms of cancer, with hepatitis C, with drug-resistant TB, and their families and friends are daily facing avoidable suffering and loss because life-saving medicines are grossly overpriced,” they added. The United Nations acknowledged existence of problems in the access to medicines and convened a High-Level Panel in November 2015, following the adoption of the 2030 Sustainable Development Goals. The 16-member panel is led by Ruth Dreifuss, former president of Switzerland, and Festus Mogae, past president of Botswana. “I established the High-Level Panel on Access to Medicines to address these issues. I have asked it to make recommendations for a coherent set of policies that addresses the rights of inventors, international human rights law, trade rules and public health,” Secretary General Ban said. The panel’s aim was to address the policy incoherence between the justifiable rights of inventors, international human rights law, trade rules and public health in the context of health technologies. Expert contributions were sought from all stakeholders and 182 submissions were subsequently received from the private sector government, civil society groups, multilateral organizations and academia. In March 2016, the panel held two global dialogues – in London and Johannesburg – where participants from around the world gathered in person and online to discuss and propose solutions to the challenges of promoting innovation and access to medicines, vaccines and diagnostics. The meeting in Durban follows eight months of intensive collaboration by the panel, which is comprised of members from industry, government, civil society and academia. As the panel finalises its report before presenting it to the UN Secretary-General stakeholders continue debating what should be in it and how it should be used. Mandeep Dhaliwal, director of health and HIV at the UN Development Programme (UNDP), said she hoped this report helps to develop new pathways to innovation and access to health technologies. Lorena Di Giano, member of the High-Level Panel’s Expert Advisory Group and general coordinator of the Latin American Network for Access to Medicines, acknowledged that millions of people died unnecessary in South Africa and across the world because HIV and AIDS drugs weren’t available to those that needed them. “We must relook at a system that doesn’t produce the innovation needed to tackle ancient diseases like tuberculosis or indeed ensure health technologies are reaching those that need them most,” Di Giano said. Activists urged Ban and all members of the HLP to place the right of affordable access to healthcare ahead of the private, monopoly-based interests of pharmaceutical companies and their shareholders. In June, the High-Level Panel on Access to Medicines poured water on several commentaries based on alleged drafts of the panel’s report, saying they were still actively working on the report and unable to comment on the contents of the report. “Any commentaries based on improperly obtained, incomplete drafts do not represent the findings of the Panel,” they said in a statement. The final report is expected to gather all input from panelists and the 182 contributors. In a discussion forum held on the UN High Level Panel co-hosted by Treatment Action Campaign, Stop AIDS and Open Society Foundation and hosted by Oxfam, Precious Matsoso, director general, Ministry of Health, South Africa, was full of optimism that report will help deal with issues of access to medicines, saying it was one more chance for governments help their people get affordable drugs they want. Tobeka Daki, HER2+ breast cancer patient or human epidermal growth factor receptor 2- an aggressive form of cancer said her medical aid declined to pay for expensive cancer treatment – Trastuzumab. Her cancer has since spread to her spinal cord. “So many South Africans are not told about the existence of this drug by their doctors because it’s too expensive,” she said. The drug cost half a million rand in South Africa and some secondary patents have been blocked until 2023, according to Lotti Rutter, advocacy and campaigns manager for TAC. She said Entercavier, the treatment for hepatitis had its initial patent in South Africa expiring in 2011 and the current medication is not affordable. Patents created barriers to access she said, adding that patents create neglected diseases. Rutter emphasised that drug industry is driven by money rather than public health interests. Citing South Africa as an example, she said the country blindly hands out patents for example in 2008, 2,442 patents in comparison to 273 that were granted in Brazil in five years. “We want the report to be released as soon as possible and we hope governments and organisations will seriously engage with the recommendations of the report,” said Rutter. Catherine Tomlinson, Open Society Foundation researcher, said it was known that the public health system is not delivering affordable medicines and it is no longer an African problem but has grown globally. “Research and development is not delivering innovation that we need. Tuberculosis has had two new products in the past 50 years,” she said, adding that this needs to change. Tomlinson said committing funds for research should be made mandatory for research while governments should shoulder the risk of research. She highlighted the need for transparency by funders and governments. “Transparency in financing research and development by pharmaceutical companies will show the real cost of R&D that they use to raise costs,” she said adding that a sustainable financing mechanism will be required. Such information will be useful for civil society and push their advocacy forward, she said. Tenu Avafia of the High-Level Panel secretariat said he hoped the report would build on successes of the current system where they exist, while addressing areas where there are clearly unmet health needs. "AIDS Conference: Will The UN High-Level Panel Report Deliver R&D And Access To Medicines?" by Intellectual Property Watch is licensed under a Creative Commons Attribution-NonCommercial-ShareAlike 4.0 International License.